We got our pretty new business cards this week! I have several other business tidbits to share today as well. We are discontinuing our line of pewter figurines and reduced the prices of the remaining few we have in stock. If you have been eying one, this is your last chance, because after these are gone, there will be no more made! 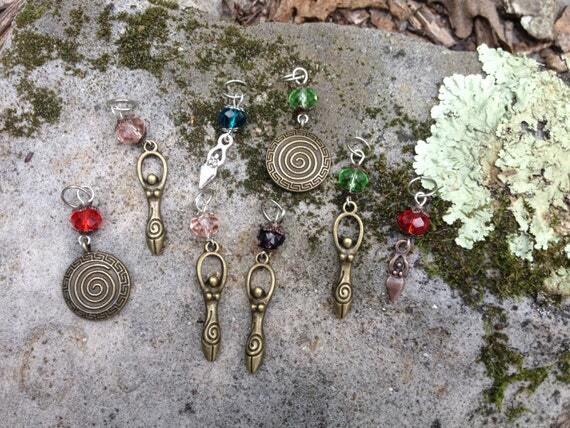 While we’ve sold our little “scrap goddesses” individually for while, we have some new ones available in small lots. A friend called these “gummy bear goddesses,” and that is how they look! These are very small, have rough edges, and do not sit on their own, but they would make a lovely little token to give to birthy friends, to clients, or to transform into your own projects (magnets, glued to a candle holder, etc.). These are only available by the lot and only as we happen to have them available! I also want to mention that we are happy to put together small lots of items by request at a discount, particularly for Sacred Pregnancy Retreat Facilitators, but for other birth educators and doulas too. These can be custom arranged for things that we don’t necessarily have listed in our etsy shop (for example, we recently sent 12 tiny goddesses and 12 tree pendants to a Sacred Pregnancy retreat in Canada). We have “beauty” charms and goddess charms and spiral charms that aren’t available by separate listing, but that can be mixed and matched to create something nice to give to the beautiful women who come to your retreats and classes. We do not provide these for free (though we always include secret, surprise bonus goodies for free! ), but we are happy to do bulk pricing. Why not free, you might ask? We actually do make donations of our work each month to nonprofit events and organizations, but if you are a for profit business, then a fair energy exchange is appropriate rather than a donation. 🙂 We are a small, two-person home business ourselves and we love to collaborate!